If you grow a lot of Rhubarb, consider making some delicious wine with some of your harvest. It’s tasty and easy to make – here’s how to make Rhubarb Wine. The middle of June is the ideal time to pick your Rhubarb stalks if you live in the North. 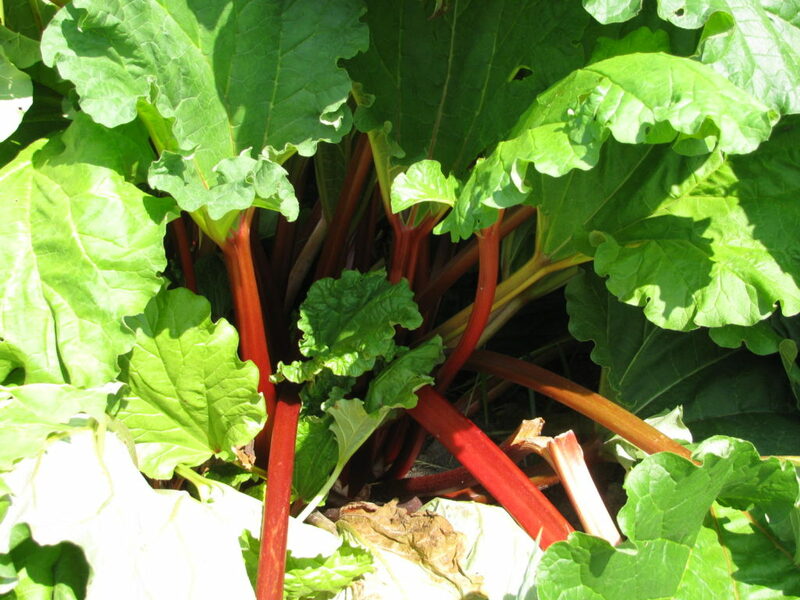 Want to learn how to grow Rhubarb? When you pick them, you can either twist the stalk (close to the ground) to snap it off or cut it using a paring knife. Be sure to leave several of the smaller stalks on the plant. This way, your Rhubarb plant will continue to grow. We have 5 Rhubarb plants. Last Fall, Graham made a new bed for them to go into. They had been in our Berry Bed and it was getting too crowded and weedy in there. We also wanted to enlarge the Garlic Bed, so something had to be moved out, in order to give us more room. Ready to make wine? When your Rhubarb is ready to be picked, harvest it. 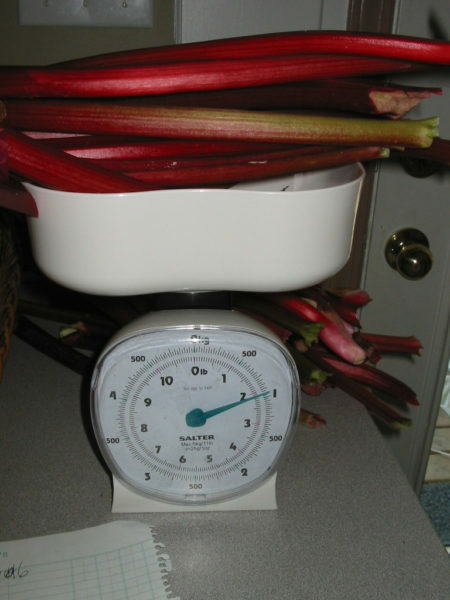 Weigh the stalks – you will need 5 pounds for every 1 gallon of wine. 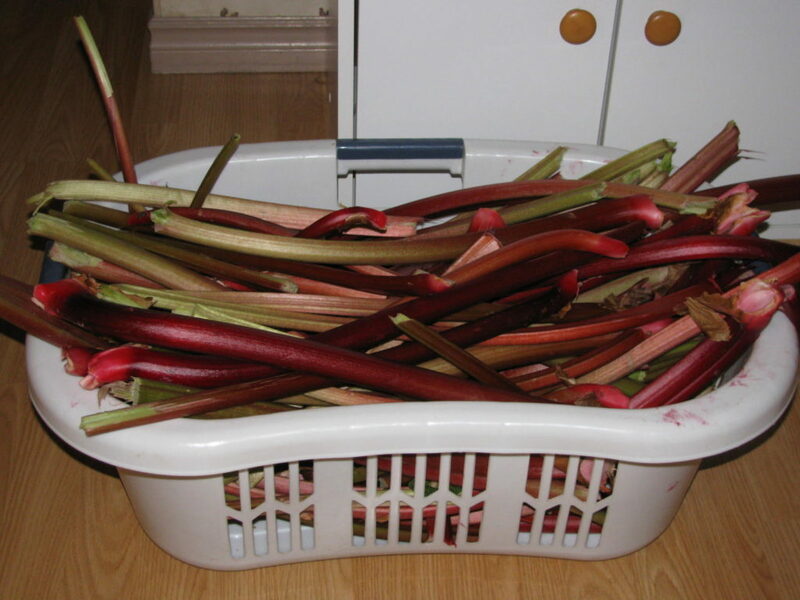 (This year we ended up with 37 pounds of Rhubarb from those 5 plants!) Clean out a primary fermenter and snap all the stalks many times. You don’t need to cleanly break each stalk into pieces, just give them a quick snap so the rhubarb is exposed. The more times you can snap each stalk, the better as more surface area is exposed. Snap the stalks into the primary container and pour cold water over to cover them. 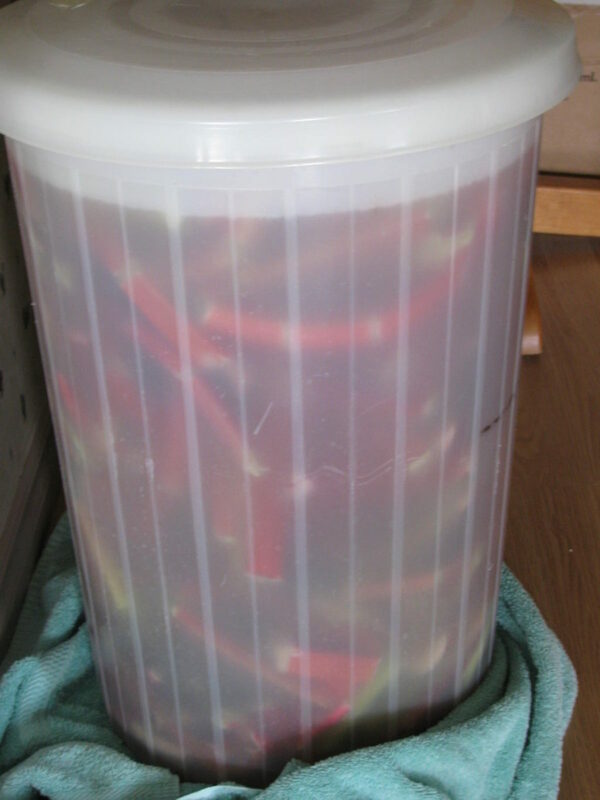 Now let it sit 3 days (give it a stir every day) then scoop out the rhubarb and leave the water behind. Do NOT mash the rhubarb, as this can lead to a cloudy wine. 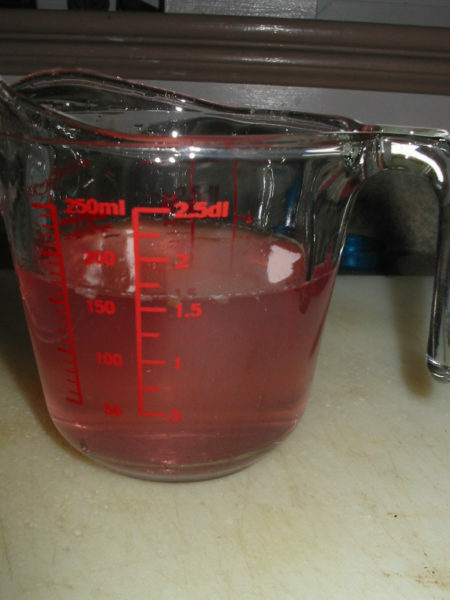 Hold the Rhubarb above the liquid for a minute to let most of the excess liquid drip back into the primary. Give it a light squeeze to get more juice out but don’t squeeze it too hard. 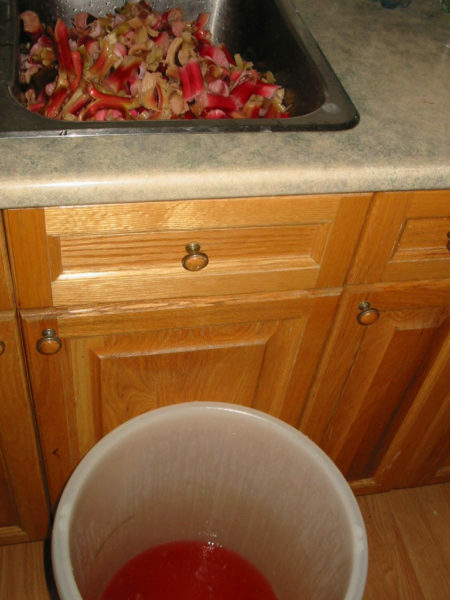 If you have chickens or pigs, they will love this leftover Rhubarb. 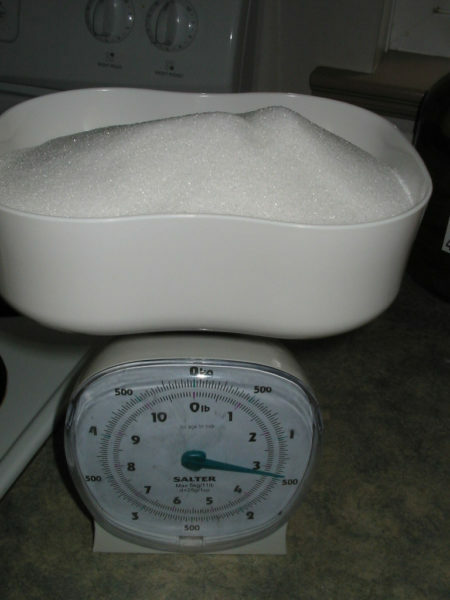 According to the recipe, I had to add 3 lbs of sugar for every 1 gallon of liquid. I stirred the sugar really well to get it dissolved. You may find it easier to make a sugar syrup on the stove as the sugar will completely dissolve before adding to the fermenter. After you add the sugar, test the specific gravity with the hydrometer. You are looking for a reading of 10 – 12%. If it is closer to 10% you may want to add some more sugar. Next add a few Camden tablets (optional). 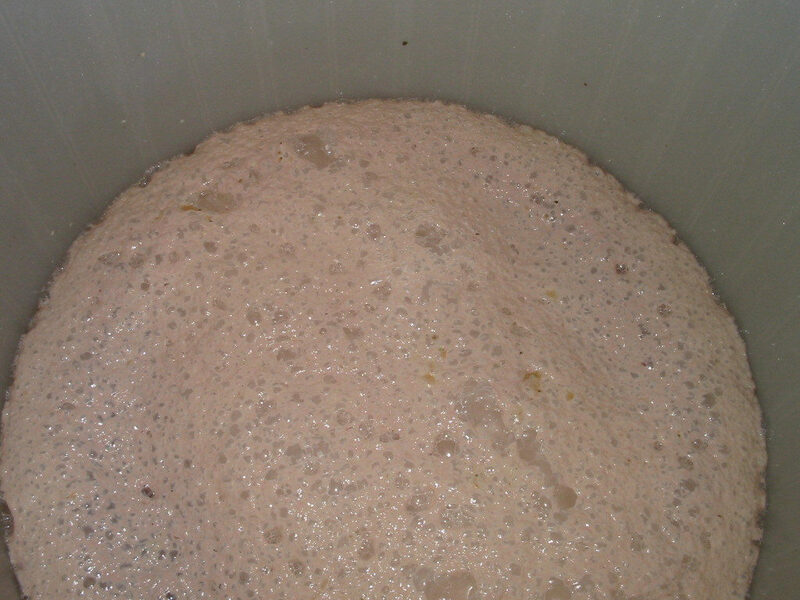 Pour this liquid into the primary fermenter. Look at the pretty pink! Now, sprinkle 1 packet of wine yeast over the top of the liquid; don’t stir it in, just leave it sitting on top of the liquid. It’s supposed to start foaming, which means the wine is working. It will be foaming for a couple of days and then it will stop. When it does, rack it down from the primary fermenter into a carboy. Make sure you don’t let the siphon tube sit at the bottom – you want to leave the musty sediment behind. Rack it down again into a clean carboy in a few weeks, then let it sit for 6 months till it can be bottled. 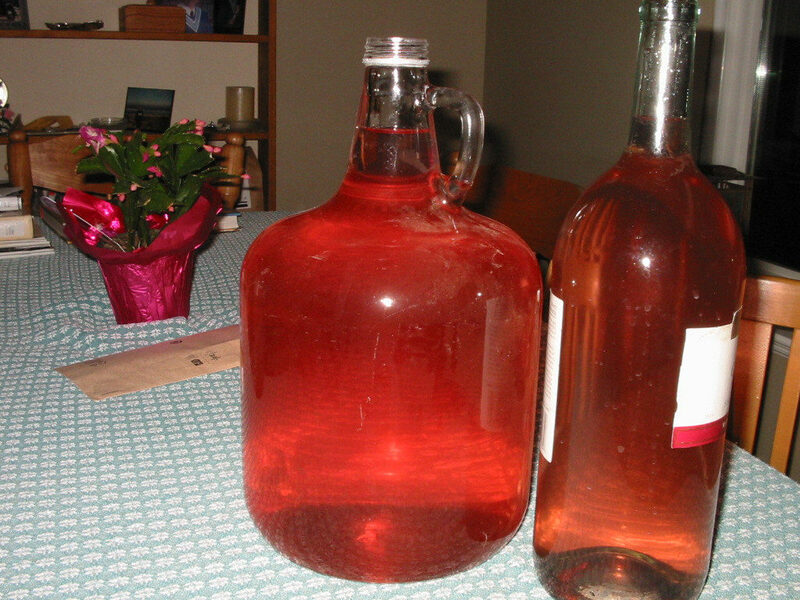 Whenever you finish racking wine, lift the carboy up onto a table or counter right away. It needs to sit someplace undisturbed. This way, the sediment will begin to fall to the bottom. You want your carboy up high, so you don’t have to move it up before racking next time. Every time you move the carboy, the sediment at the bottom will start to move throughout the liquid again. Before you bottle it, rack it down one last time into another clean carboy. Then, let it sit for another four or five days so any sediment left has a chance to fall to the bottom. You always want to make sure to leave all the sediment behind. When it comes to making wine, you simply cannot rack it too many times. Some people will rack the wine four or five times before they bottle. What you are trying to do is make sure you have no sediment left at the bottom of the carboy, before racking into the individual bottles. Be sure your siphon hose does NOT go all the way to the bottom of the carboy. We use a clothespin to help hold the hose at the level we want. The finished result – a beautiful pink colour. It will taste great in a few months. Squirrel some away so you can try a bottle from this batch next year! Bottle them with corks, using a corker and then lay them on their side. Enjoy your Rhubarb Wine! Annie, our rhubarb is in its 3rd year. It looked really good and healthy, but the stalks just don’t turn red. One or two and my husband ate them. I am so disappointed in them. What would cause it to never turn red? Thanks for your advice. Kat, there are several different varieties of Rhubarb. Some of them do have Green stalks, that never turn red. This is perhaps the kind you have? If you want red stalks, you will need to buy a red variety. You would only need to buy 1 or at the most 2 plants. Then don’t pick any the first Spring after planting. 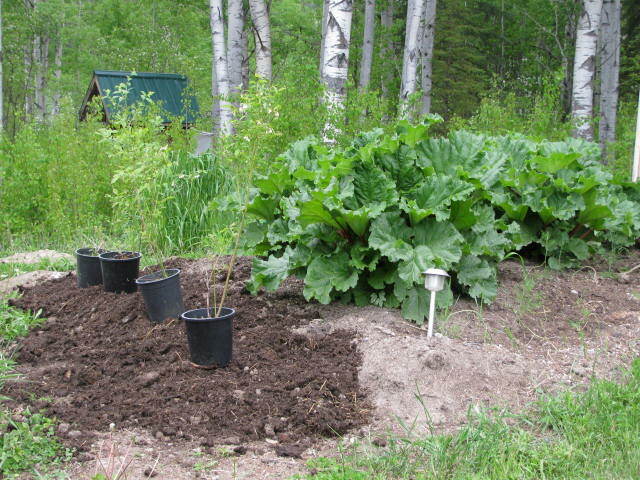 The following Spring, you will be able to pick and later in the Fall, split your Rhubarb roots in half. You will end up with double the amount of plants. You can then pick them heavily the following Spring. Just be sure to leave some small stalks on the plant, in order for it to continue to grow. I would think the green would make as good a wine as the red… the red is more colorful though! Yes I don’t know that I would find the green very attractive in the glass. Rhubarb wine… trippy. My first try at a cab was a disaster (I think I ended up with some cleaning solution/acid in my batch). Since that first attempt, I have found that it is both a science, and an art! My second batch was good, but not great (still a success if I do say so myself). I did find a website that helped a ton though at http://www.how-to-make-wine.com (broke down and paid, but it really was well worth it as my third batch ROCKED!). I am sure there are others too, but the info worked well for me. Cheers…(clink)! Hi Bert, it does take a few tries usually to get some great tasting wine. Check through our recipes under Wild Wines, we make a good variety. Right now I am picking enough Raspberries to make maybe 2 1/2 gallons of wine. I have been told that the red color goes away over time. 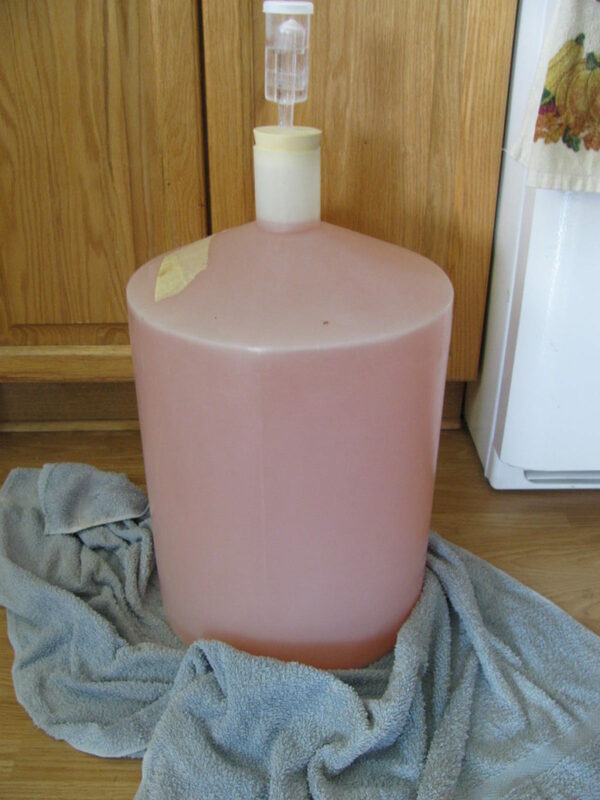 All my Rhubarb wine starts out pink, then eventually turns clear. Yes unfortunately, it does tend to lose its colour over time. We keep ours in a dark room, I don’t know if that helps but it is worth a try.